That could be a very good idea. Not sure if it makes the game to easy but it would definitely remove the "i have to be on line with the enemy". Would i like to focus on one specific enemy if there are multiple ones? I guess yes. Would i need a "select" or "switch" target option? I guess yes and that might be a bit much. Maybe i try an "auto aim area" which is always in front of the player and only enemies in this area will be targeted without choice? I will give it a try once i figured out my problem with this stupid digging mechanic. Puh...i got the digging mechanic working using the tile api. Next are the weapons and creating relations between the fire spreading and the digging. I am working on a auto target system for the laser gun right now and i am not sure if it makes a lot sense. Giving the player control what to target is too much micromanagement for the player. I added a core reactor to every ship. The ship will blow up piece by pice if you destroy it which will be needed to reach certain goals. 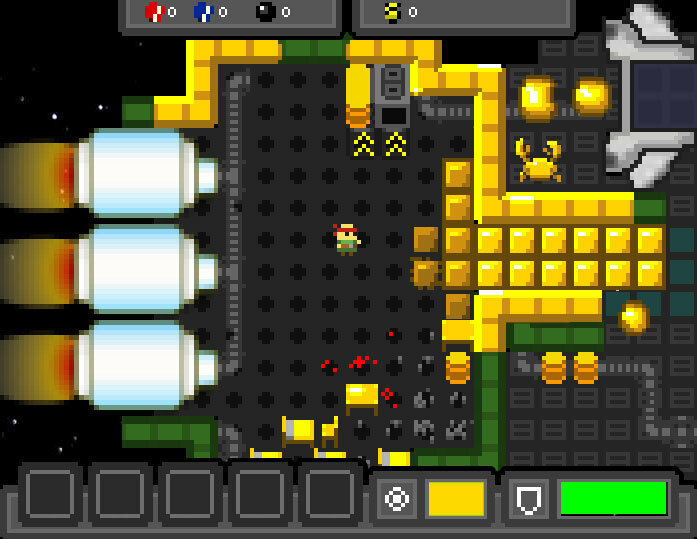 The player will be sucked into space if not running to safety. Please let me know which one you prefer! It just takes little time to test and would be a great help. That's a really long loading time for Flash. What's the size of your game? I will switch to download PC/Mac for the alpha. I need better performance as well. Option 3 is probably what most players will expect for 4-way shooting. It plays OK, but it looks odd for the player to shoot from the side/behind. Maybe face the player in the direction of shooting if one of the arrow keys is held down, but otherwise face in the direction of movement. This was a quick build. I would add that! I fixed it in the link above and like it (have to add the moving feed though)! The auto aim from the other version feels weird now. Here a sneak of the Bank Heist Ship. I figured out that i need to advance the enemy behaviour to create more interesting situations and more fun. The enemy is now in a passive idle state (smoking cigarettes or whatever). It will change into an "being aware state" for a while if the player is close enough but can move back to idle. This enables passing enemies without fights. Finally the enemy will turn into hostile mode if player stays close. Just played the demo, great work, look forward to watching it progress. First: I am currently reworking all enemy behaviours. Second: I am implementing a global alarm state which can be triggered (which then will spawn a lot enemies and change parts of the level). I will release a "demo2" when that is done.